From design to install, large restaurant equipment to smallwares, the KaTom Contract & Design Department has you covered. If you are just starting out on a major project, our bids specialists will work to customize your order to your exact specifications within your budget. With a GSA contract and a long list of major projects to recommend KaTom, you can trust our team to work as hard to ensure your success as you do. Whether you need 6-inch tongs or a three-section commercial refrigerator, we are your full-service provider. When it's time to layout your foodservice operation, we have the capability to assist you with the entire design process. 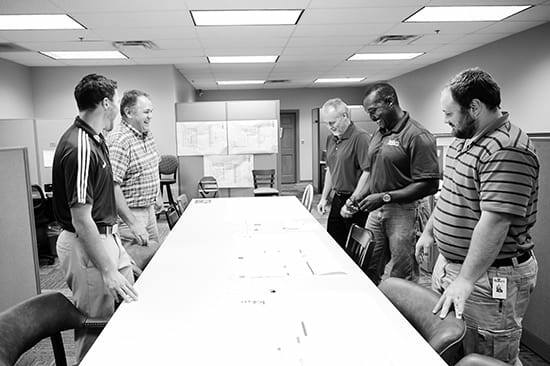 From creating a more efficient floorplan for your renovation to crafting front- and back-of-house areas for your commercial kitchen, our CAD specialists and project management team will put decades of experience to work for you. With designs to their credit that span the country, from Los Angeles to Times Square, our major projects team has the credentials to take on any job. Our project managers will work with your general contractor and any sub-contractors in crafting the plan while applying considerations suggested by you and your kitchen manager. Meetings throughout the process will ensure every requirement is met while increasing efficiency and flow, both in back-of-house and front-of-house areas. From reorganizing an entire chain of restaurant kitchens to improve workflow to designing your first eatery, KaTom can take a floor plan with or without an equipment layout and help you produce a highly-efficient kitchen. All that with an eye toward your budget and finding the most cost-effective way to complete the work. When everything starts coming in for your site, we can stage your restaurant equipment in our 100,000-square-foot warehouse and hold it until you’re ready for it to be delivered. Our project managers will coordinate the efforts of our installers and can even be on-site to oversee every step of the effort. Do you need a quote for your foodservice equipment and supplies project? Let us help you and do all the work! You can either contact us at 865-225-1561, email us at bids@katom.com, or simply submit the form below and we will get back to you within 24 hours. What is the sum of 10+2?